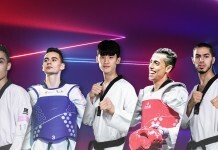 HAMMAMET, Tunisia (April 13, 2018) – Iran and Serbia won two golds each on an explosive fourth day of action at the World Taekwondo Junior Championships. These golds meant that Iran extended their gold medal tally to six, whilst Serbia claimed their first two. Serdja Stevic of Serbia in the junior women’s -59kg, Mahdi Mohammad Emadi of Iran in the junior men’s -68kg, Nadica Bozanic of Serbia in the junior women’s -63kg and Ali Eshkevarian of Iran in the -73kg claimed the gold medals on offer. 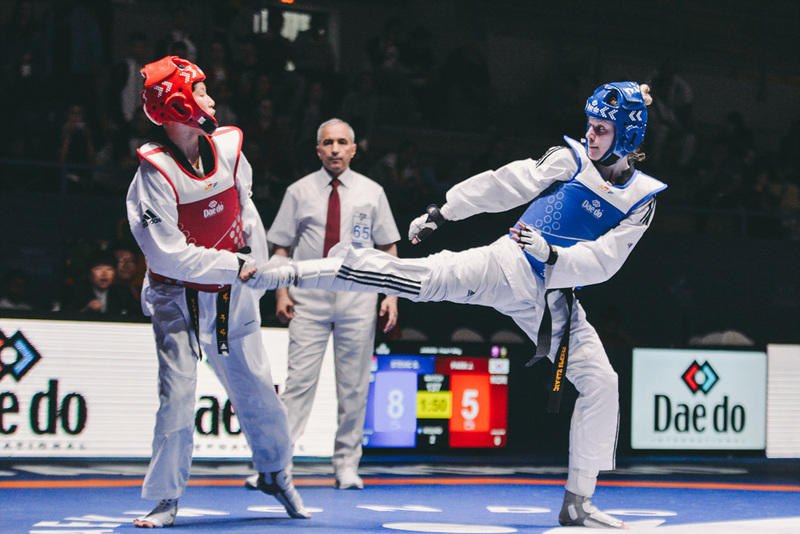 Serdja Stevic of Serbia and Ju-A Park of Korea fought in the final of the junior women’s -59kg. The first final of the day exploded into action as Park landed two punches followed by a kick to the trunk within the first 10 seconds. However, Stevic managed to compose herself and landed three front kicks to the trunk to take the lead. The first round ended frantically, but Stevic claimed an 8-5 lead going into the second round. Round two was exhilarating. Both fighters gave everything to stamp their authority on the fight. Each of the athletes landed multiple kicks and punches to the head and trunk. But it was Stevic who took a narrow 17-15 lead into the final round. In the third round, both fighters showed incredible courage and attacking prowess. However, in the final minute of the match Stevic developed an uncatchable lead with a combination of impressive kicks to the head and trunk. Stevic won the match 32-23 and claimed Serbia’s first gold of the tournament. The bronze medals were won by Liliia Khuzina of Russia and Anamarija Georgievska of Macedonia. The junior men’s -68kg final saw Mahdi Mohammad Emadi of Iran and CJ Nickolas of USA fight for the gold medal on offer. Both fighters started relatively tentatively as neither wanted to concede an early point. On the 30 second mark, it was Emadi who landed the first blow with a kick to the trunk only for Nickolas to immediately close the gap with a punch to the trunk. Nickolas then looked to take the lead with a string of attempted spin kicks, but received consecutive gam-jeons for falling to the ground. Round 1 ended with Emadi 5-1 up. Nickolas composed himself in the second round as both fighters showed strong defensive abilities; neither managed to score a point. Emadi looked to have put the fight out of reach with a series of front kicks to the trunk and head in the early stages of the final round. However, Nickolas didn’t give up and managed to fight his way back into contention. With 30 seconds left to play, Emadi had a narrow 13-8 lead in a fight which looked like it could go either way. However, Emadi held his nerve and claimed an impressive 18-10 victory. That was Iran’s fifth gold in what has been a very profitable tournament for them so far. Dusan Bozanic of Serbia and Ivan Paulouski of Belarus claimed the bronze medals on offer. The penultimate final of the day saw Nadica Bozanic of Serbia and Nika Klepac of Croatia compete in the junior women’s -63kg. Klepac started the fight with intent as she landed an early punch and kick to the trunk followed by another kick to the head to go 6-0 up after 30 seconds. Bozanic then responded with a front kick to the trunk only for it to be cancelled out by Klepac. Bozanic had it all to do as she went into the second round trailing 8-2. However, she showed immense spirit by closing the gap to 7-8 with an early kick to the head followed by a kick to the trunk 10 seconds later. Klepac took a narrow 8-7 lead into the third round. In the last round, Bozanic immediately levelled the score by forcing Klepac into conceding a gam-jeon. The fight was tied until the last 30 seconds where Bozanic landed a powerful front kick to the head. Bozanic put the fight out of reach with another kick and punch to the trunk. This was probably the comeback of the tournament so far as Bozanic claimed Serbia’s second gold of the day. The bronze medals were claimed by Jang Yu-Jin of Korea and Celine Schmidt of Germany. The junior men’s -73kg final was contested by Ali Eshkevarian of Iran and Adrian Wojtkowiak of Poland. Eshkevarian conceded an early gam-jeon, but composed himself enough to land a series of kicks to the head and trunk immediately. Wojtkowiak then landed an impressive reverse hook kick to the trunk, but Eshkevarian responded once more to take a 14-3 lead into the second round. The second round continued in a similar fashion as Eshkevarian landed four kicks to the trunk within 20 seconds. Wojtkowiak looked to react but Eshkevarian was too strong all round. Eshkevarian went on to land another kick to the trunk in the last 5 seconds to put the fight to bed. Eshkevarian ended the round 20 points up meaning the fight was won. Eshkevarian claimed Iran’s second gold of the day and sixth of the tournament by winning 26-6 in the last final of another captivating day of action in Hammamet. Badr Achab of Belgium and Vladyslav Yerko of Ukraine won the bronze medals.